It’s October—it means it’s already getting cold here in this Mama’s Corner of the World, Halloween is on its way—and it’s National Breast Cancer Awareness Month. 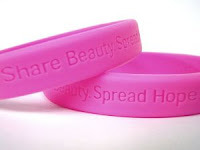 You have probably already noticed that most stores, businesses and products have donned a shade of pink to promote awareness—and, unfortunately, in many cases, to promote sales. The term “pinkwashing” refers to businesses and groups profiting from pink awareness activities and events—while contributing in other ways to breast cancer’s causes and risks. Hmm…That sounds ethical, doesn’t it? Let me take a moment to share the view of pinkwashing from A Mamas’s Corner of the World. Pinkwashing is bad—but, promoting breast cancer awareness is good. While I would love it if some of the more offensive, pinkwashing companies put more effort into prevention and overall product health and safety—sometimes it’s necessary to accept that the added breast cancer awareness efforts, even by less than perfect companies, serve a purpose. Added awareness means more screenings, tests and early detections—and, if consumers make wise purchasing choices, at least some of the pinkwasher’s profits go toward breast cancer research funding or to cancer centers. Mama knows how to say no. As a blogger, the Mama’s Corner of the World crew receives lots of PR emails and requests from companies to review products and services. Lots of those products in October are Pink. Company A wants us to spread the word about their breast cancer donation effort, Company B wants us to review a “limited edition”, special “pink-friendly” product, Company C wants us to spread awareness about their Breast Cancer Awareness month activities and community events. We have chosen two companies’ efforts to support over the next few weeks because we have researched the many Breast Cancer Awareness campaigns presented to us and think that the actual benefits of the planned activities stand to outweigh the profits and risks. Mama’s Corner of the World encourages Breast Cancer Awareness and pinkwashing awareness. Just as companies and even individuals are able to buy green, environmental offsets to counteract their environmental impact, they should be able to give back to a worthy cause such as breast cancer awareness. Mama would like to encourage readers to be aware of pinkwashing as you visit catalogs, online shops and store aisles filled with pink—and to research every company that you plan to support this month to be sure that the donation and breast cancer benefits outweigh the underlying risks and concerns. Mama uses common sense when buying pink. How much is the company donating from each purchase—and to which charities? What is the total donation limit and details of the “fine print”? Can I make a larger direct breast cancer donation by NOT buying pink? (If I buy a pink mp3 player, for example, because the company proposes a $5 donation—but, the cost of that “limited edition” mp3 player is $20 more than a comparable, non-pink counterpart, then I could have actually made a direct donation of $20 to a cancer fund of my choice.) Would I buy this brand of product anyway? If I’m already buying a certain brand, choosing the “pink” option to trigger a donation is an obvious choice—and one that I’m certainly not opposed to selecting. So—you may see a couple of “pink” products or events featured on A Mama’s Corner of the World during National Breast Cancer Awareness Month. While everyone has an opinion about pink marketing, and yours may differ from ours, we have tried to choose brands that we feel are doing at least a little more than simply jumping on the pink bandwagon during the month of October.